The most recent meeting of the Roundtable on Science and Technology for Sustainability was held on May 20-21, 2014, in Washington, DC. 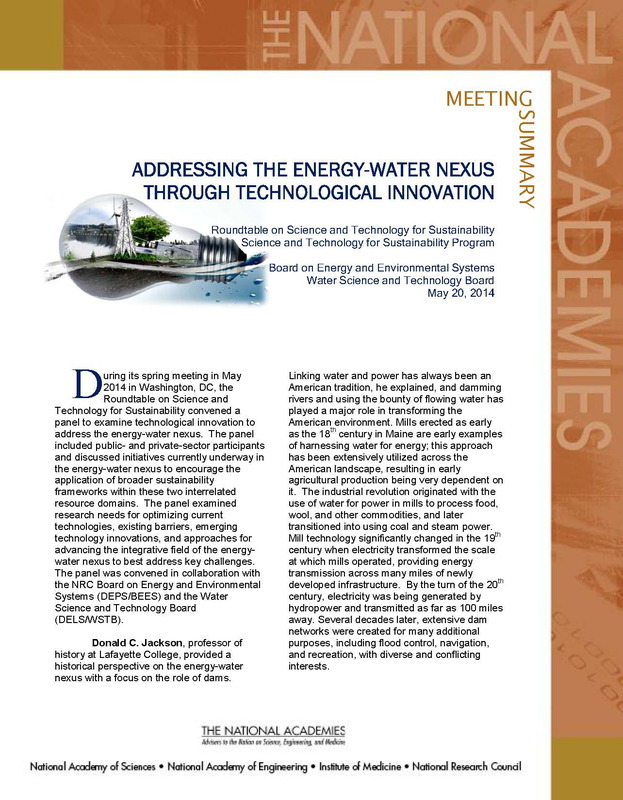 As the first event of the Roundtable’s year-long 2014 initiative, the event featured panel discussions addressing issues related to the energy-water nexus through further technological innovation. The purpose of this initiative is to encourage participants to leverage the initiatives currently underway in the energy-water nexus and to encourage the application of broader sustainability frameworks to these two inter-related sectors. The panels examined research needs for optimizing current technologies, addressing existing barriers and emerging technology innovations, and advancing the integrative field of the energy-water nexus to address key challenges. The event was convened in collaboration with the Board on Energy and Environmental Systems (DEPS/BEES) and the Water Science and Technology Board (DELS/WSTB). A brief summary of the event was issued in fall 2014. The May 20th afternoon event featured panel discussions addressing issues related to public-private partnerships. The 2013 NRC landmark report, Sustainability for the Nation: Resource Connections and Governance Linkages, reiterates the importance of this issue and states, “Governing for sustainability requires bringing the right complement of people to the table, acknowledging the linkages across societal and governance institutions”(p. 3). As a follow up to this report, the panel provided examples of successful efforts for addressing complex sustainability issues and factors that contributed to that success, by gathering various perspectives on collaborative problem solving process both in Minnesota and nationally. Roundtable members reviewed and provided suggestions on current and planned STS Program activities, including further dissemination of Sustainability for the Nation: Resource Connections & Governance Linkages (Report released in June 2013), Considerations for the Future of Animal Science Research (Report forthcoming), Pathways to Urban Sustainability: Challenges and Opportunities (Project in development) as well as the ongoing Network for Emerging Leaders in Sustainability. Updates on a recent NRC report, Abrupt Impacts of Climate Change: Anticipating Surprises (2013) from the Board on Atmospheric Sciences and Climate, and Transportation Research Board’s activities were also provided. Roundtable members also raised suggestions for future Roundtable activities. B.L. Turner II, Arizona State University/Dennis Treacy, Smithfield Foods, Inc.
Disclaimer: This website contains unedited verbatim presentations made by meeting participants and is not an official report of the National Academies. Opinions and statements included in this material are solely those of the individual authors. They have not been verified as accurate, nor do they necessarily represent the views of other meeting participants, the committee, or the National Academies.